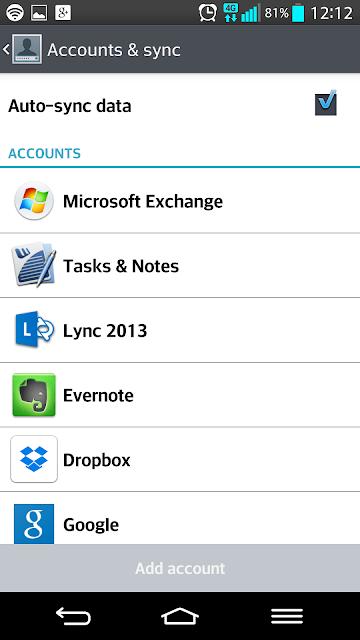 I got an iPhone 4S as a work phone at my office, and it syncs mail, notes, calendar, contacts and tasks with Outlook on my Windows (ugh) work PC via Microsoft Exchange, so I started to experiment to add the same Exchange account on my Android devices and my Mac. To my surprise it worked very well! 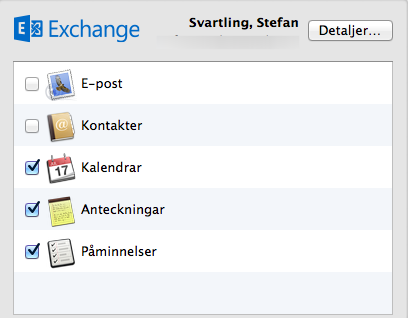 So I am now moving my whole GTD system that I have in Evernote to this Exchange sync instead. Tasks is synced between the app Reminders on my iPhone and Mac, with Outlook Tasks on my Windows PC. 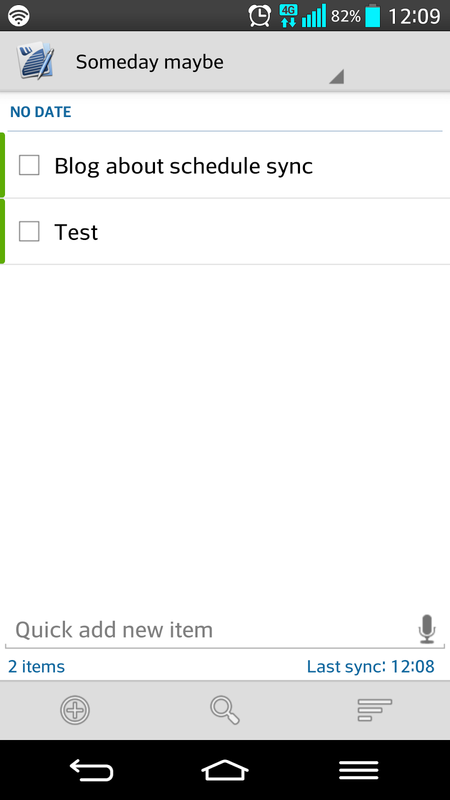 And even better, it syncs perfectly fine with the Android app called Tasks & Notes. The LG G2 has it’s own compatible Outlook Tasks app called Tasks, but this Tasks & Notes app is both better and more beautiful. This Android app also syncs the Outlook Notes, same notes is also synced with both Notes apps on my iPhone and Mac too. Of course I know also syncs all my calendars via the Exchange Sync, so that I have the same updated calendar on all my devices. Even the Outlook Tasks shows up in the Calandar view too, so it is easy to see what tasks that should be done on a specific day. On my Android devices I use the Google Calendar, and on my Apple devices I use iCal. And on the Windows PC I use Outlook of course. The iPhone runs iOS 7 and that means that it has a very useful and beautiful notification center that now shows the current tasks and calendar events in an easy way. It’s perfect for a total overview of the day. On my Android devices I use widgets for the Calendar and the Tasks & Notes app to have a nice overview over the current tasks. Also the notifications is great looking and you can snooze or mark them as done directly from the notifications menu. On my Mac the Reminders app works great and everything in sync, and also the notifications. The notifications syncs with my iPhone. So now I have made the GTD “lists” Inbox, Next Actions and Someday/Maybe in Outlook Tasks. These lists then are synced and transferred to all my devices, so if I add or remove a task from these lists they instantly gets updated on all my devices at the same time. Awesome. I will check if Omnifocus that I own for both iOS and OS X works with Microsoft Exchange syncing, then I will use that instead of Apple’s Reminders, but it probably won’t work. 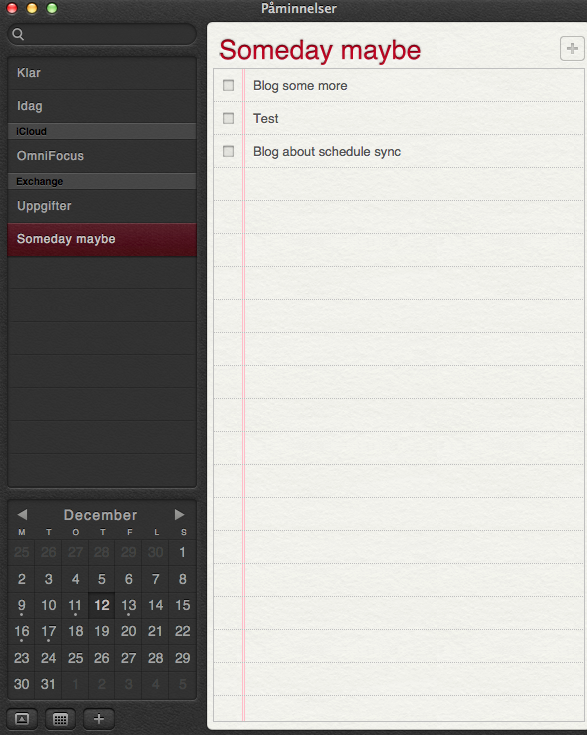 This new GTD system will make me even more productive, work faster and remember more. I like the Exchange syncing a lot.